It has not been an easy week, lots of challenges that have me looking forward to things settling down. The biggest stress source has been getting sick while getting my mom ready for a big hip surgery tomorrow, eek! I’ve been fighting off an annoying cold most of last week, that proved to be something more sinister when I came home Thursday really tired with a fever and took a sick day Friday after not getting any sleep. But feeling better now, going through lots of turmeric tea, and grateful to be ready to tackle the to do list before tomorrow and working through the recovery. Hoping to be much better tomorrow morning! 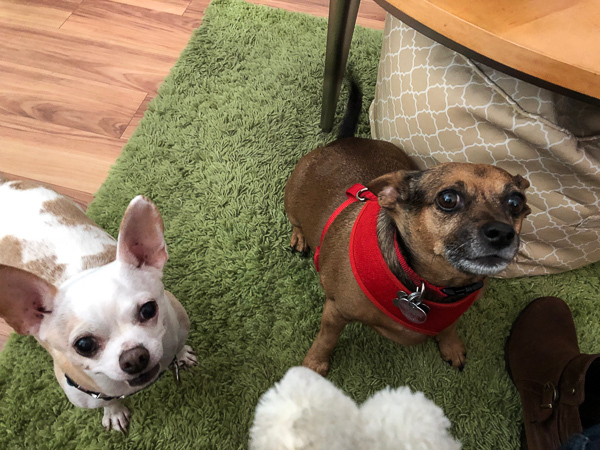 We have a house guest, my mom’s dog is staying with us while she is preparing for and recovering from the surgery and it’s been non-stop competition between him and Miko for attention since he arrived. 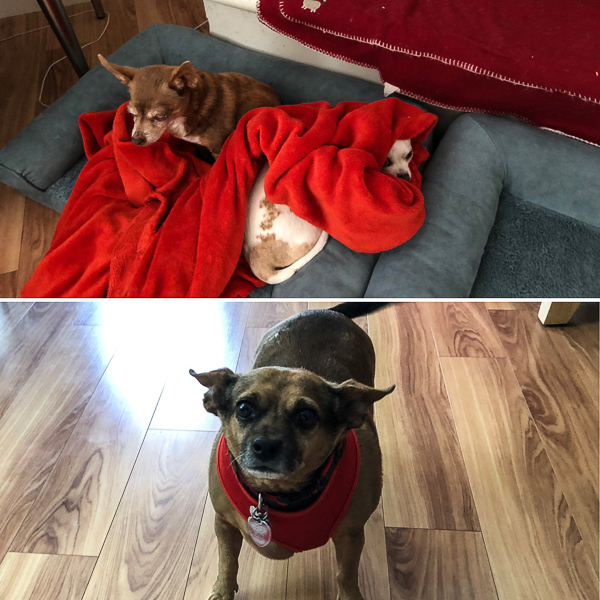 Leela could care less, but Miko wants all the blankets and cuddles. 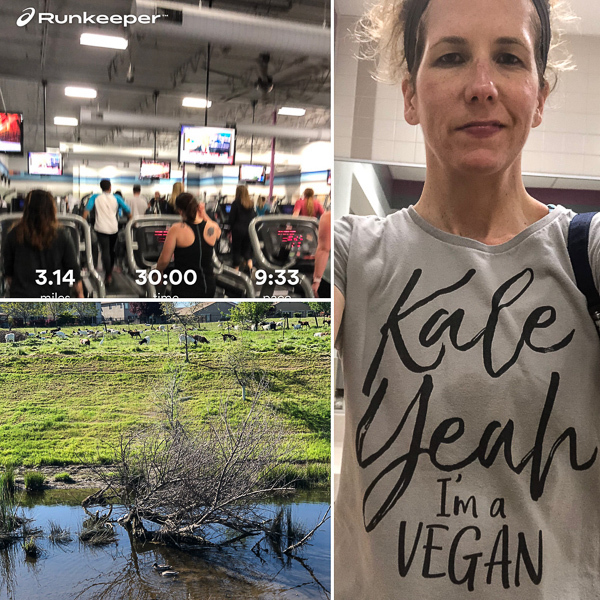 It has not been a great week of running with being sick and congested, but I have been getting through workouts and enjoyed a little outdoor time this morning for a slow 4-mile run that turned into a power walk then I got too stuffy. 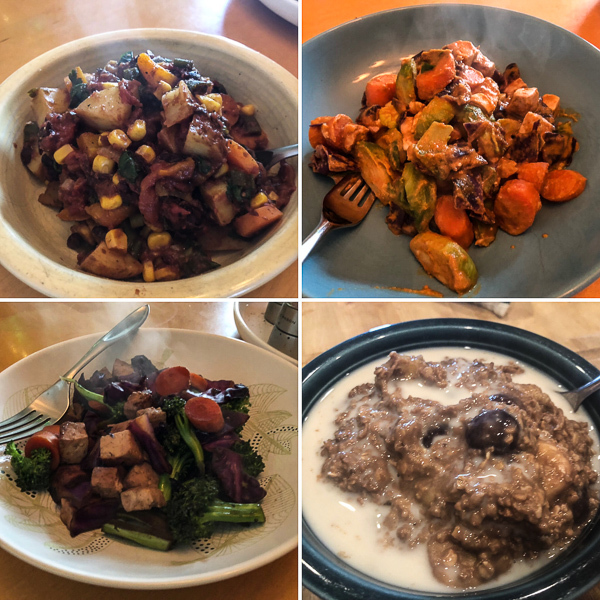 Eats have been lots of simple veggie dishes and oatmeal. I have been having fun creating oatmeal dishes for weekend breakfasts lately, green tea vanilla one morning, cherry banana with peanut and cacao powder this morning. Yum. 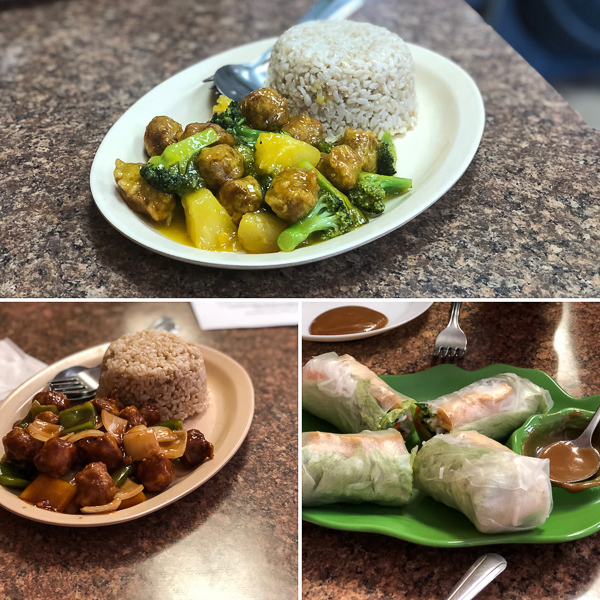 And I’ve been twice to Pho Vegan Asian Cuisine this week enjoying mock chicken and veggie dishes with brown rice and spring rolls. Once with hubby and once with my sisters and mom to discuss surgery recovery logistics. 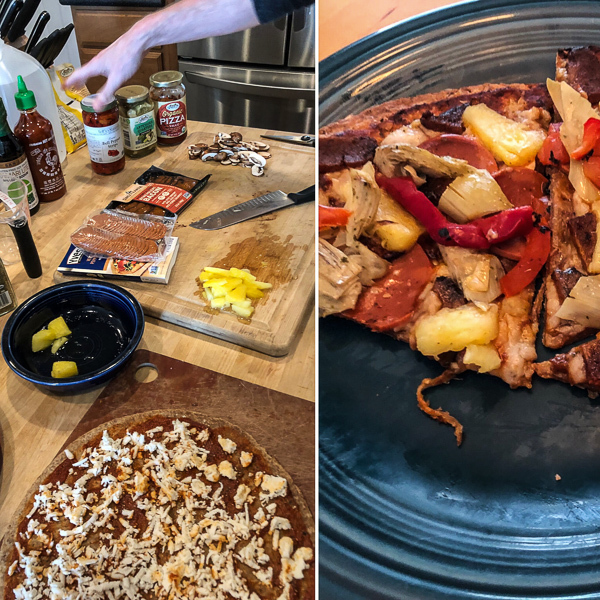 Friday night I was feeling terrible, so hubby made a great vegan pizza with Miyoko’s Vegan Mozz for dinner while I relaxed. Such a sweet heart! And I had another vegan pizza from Blaze for lunch one day, very simple with spicy red sauce and veggies. No vegan cheese or vegan meat, so more straight edge vegan. There was also a fun miso soup dish last night with Explore Cuisine Edamame Spaghetti, corn, onions, and carrots. And I found delicious Vegan Rob’s Cheddar Puffs at Grocery Outlet Saturday! These are addicting, but also have great flavor and texture for a simple list of ingredients I actually recognize compared to cheaper versions of snack puffs. They hit the spot for my weird sick food cravings. Looking forward to speedy recoveries next week and being more productive. Hope everyone has a great week! How outside and treadmill running differ. I still like both. I am a fan of anything made from recycled plastic. This is cool for more baking options I guess. The vegan guide to IKEA. I need to go soon, grrr. 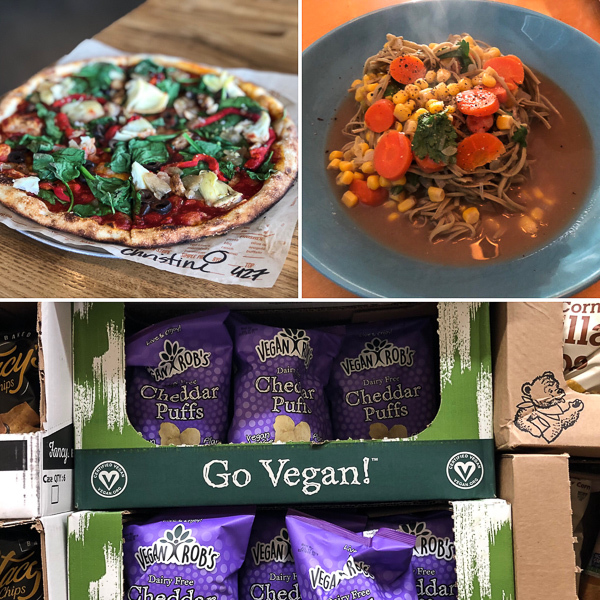 2019 is the year of vegan. And future years too! Red Robin adding the Impossible Burger too. That’s exciting for a large chain. How running saves lives. Love these stories. How to go vegan and keep you muscle. That’s a pretty big article for GQ and exciting. Vegan reasons to shop at Costco. If only ours was less crowded! Vegan travel keeps getting better. Yes it does. Simple vegan hacks from Trader Joe’s bagged salad blends. Sorry you are not feeling well! And about you mom’s surgery. Ironically, my mother in law is going in for surgery soon, too. And we have been dog sitting for my parents while they are in D.C. So I know what it’s like! Lots of extra poop for sure! haha.